The Liberal boys are 6-0 for the first time since the 2006-07 season. 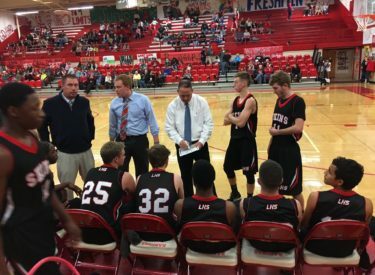 Liberal overcame a sloppy offensive performance to defeat the Perryton Rangers 52-35 Tuesday night in Ranger Gym. The Redskins led 9-0 after one quarter and 22-10 at the half. LHS led 37-23 after three. The lead ballooned to 21 at 46-25. Deladris Green led the Redskins with 13 points. Liberal made five of 12 three pointers. The Redskins win for the third consecutive year in Perryton and defeat the Rangers for the seventh consecutive time. Liberal hosts #2 4A divsision 1 Hays Friday night at about 7:45 on 1270 and kscbnews.net. The Redskins will be featured during the Rowdy Crowd Show at 5:30 Thursday night at Billy’s on 1270 and kscbnews.net.